The Canalside House in Bruges from Belgium is a luxury guest house. This is a very good option for those who are travelling the area. The guest house is fully equipped with all the necessary amenities. The architecture of the building is attractive with the location being perfect for a holiday. The atmosphere is very calm, and the environment favours it as well. The rooms are clean with necessary service always on time. With surreal views from the window, you will be guaranteed to have a great time. Find the joy in planning a D.I.Y. trip by using this awesome Bruges trip planner. 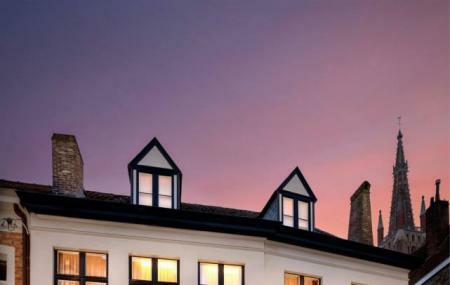 Book perfect hotels in Bruges like Hotel Botaniek, Anselmus Hotel and Martin's Brugge. Chalk out the best way to discover the city with Bruges vacation packages. Check out various modes for how to reach Bruges. How popular is Canalside House? People normally club together Menin Gate and Abbaye Du Mont Des Cats while planning their visit to Canalside House. We stayed in the Master Suite for two nights recently and had the most wonderful stay and experience with the place. The quality, peace and layout of the apartment was superb and it is set in the heart of the City. A very short walk to the center and set within one of the prettiest locations I have ever stayed in. I cant pick any fault with the service, accommodation or flexibility of the owners. You will see us again soon and well done for creating such a wonderful paradise! Extremely spacious accommodation. Lovely decor. Loved the door between bedroom & lounge appeared to be a wardrobe. Well equipped kitchenette( although used only for breakfast/supper) Close to city square & other sites . Location great for evening stroll by the canal , or to sit in nearby Arentshof park at sunset. Nice to watch / hear the horse carriages pass by outside the window. Perfect for short or long stay. This is a beautiful place to stay while in Bruges. The building, the setting, and the room we're pretty and charming and reflected the aesthetic of the city perfectly. Our host was very helpful in suggesting places to visit in the city and was very accommodating to our needs. The room was tidy, clean, and always smelled nice. Bruges is a small city, so no matter where you stay, nothing is more than a 20 minute walk at best. We were close to the church of Our Lady and to other local shops and restaurants. We stayed at the Canal House but visited the Boniface Hotel on our arrival, and both site we're beautiful and offered idiclic views of the street and/or canal. It was a very comfortable stay and I would stay there again. Wonderful loft apartment... With views of the canels... Very comfortable!